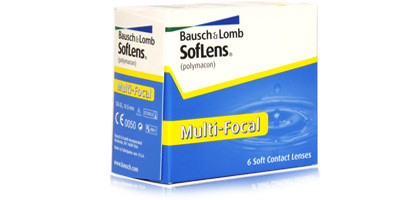 Manufactured by Bausch and Lomb, Soflens Multifocal monthly disposables supply sharp focus on objects located up close, far away and at mid-distance. If you’re one of the millions of people affected by presbyopia but don’t want to be dependent on bifocals and reading glasses, these high quality lenses could be the answer. They combine acuity of vision with consistent comfort. Soflens Multifocal lenses feature a unique Natra-Sight Optics system, which gives the wearer crisp, clear vision at all times. These lenses allow you to switch between distances seamlessly, effortlessly and faultlessly. No squinting; even for a couple of seconds! 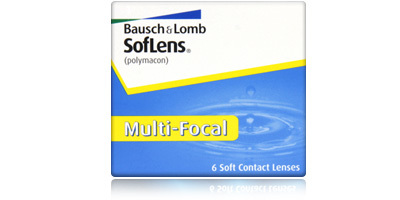 Soflens Multifocal monthly disposables are made from polymacon, a non-ionic material resistant to deposit build-up. Uninterrupted vision and a natural feel make them more comfortable and effective compared to similar lenses. 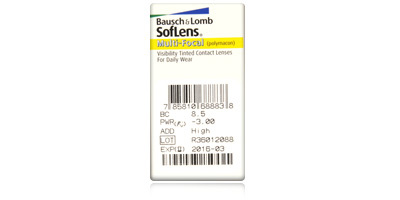 A light blue visibility tint makes Soflens Multifocals easy to see in the blister pack and simple to handle and apply out of solution. Six contact lenses are included in each box. 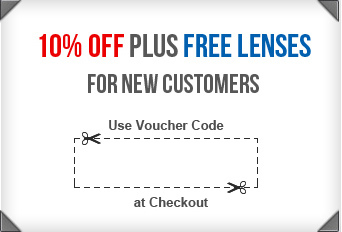 Please contact us on 0330 088 3133 with any enquiries regarding these monthly disposable lenses and any other products featured on lensite.co.uk.